Sunday is the cosiest day of the week. It’s a given fact. Add December into the mix, and in between Christmas candles and festive films there are still lots of those little Sunday jobs. I say jobs, but beauty chores is more apt because none of these things are hard and they definitely add to the cosy Sunday vibe. Cleaning your brushes. I know, so gross, but waking up to clean brushes on a Monday morning is worth the effort. De-fuzz. Everything. I tend to do some DIY brow maintenance on a Sunday, and I also use these to get rid of any peachy fuzz on my face – these are game changers. Painting your nails. I always get shellac nails now, but I paint my toes with the same colour every week – it’s OPI lincoln park after dark. DIY facial. 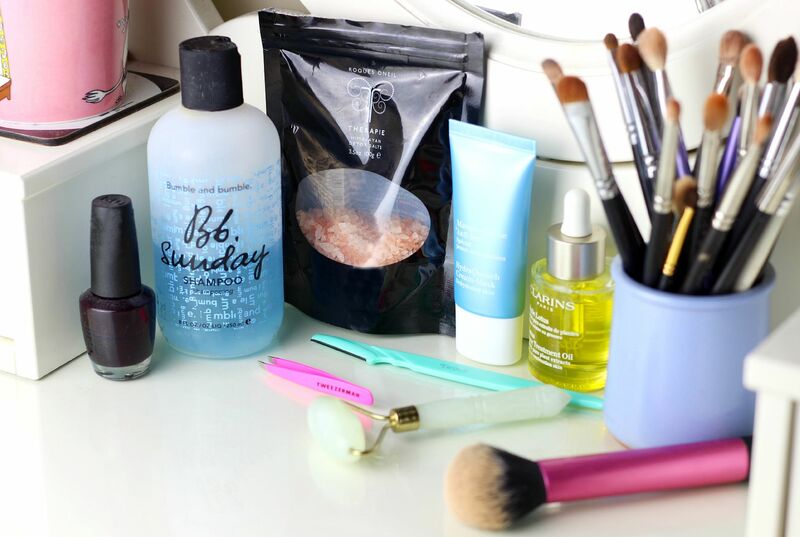 I need time to pamper my skin on the weekend, right? I do often use a mud mask on my tzone, but I definitely use something hydrating in the winter. Ah, my skin is so dry. After everything I always like to use a facial oil – at the moment I’m using the Clarins lotus oil – and then I’m working it in with the jade roller (see my post on that here). What are your Sunday beauty chores?